Home Brands and Products Sephora Collection Color Lip Last #22 Burgundy Spirit and #23 Elegant in Brown. When the temperature is unseasonably cold and damp, I always seem to seek refuge in Sephora. There is something about the neatly displayed cosmetics, helpful sale associates, spacious layout and the mid-week calming atmosphere that seems to put me in a good mood. Naturally, my impromptu visit lead me to the Sephora Collection Color Lip Last #22 Burgundy Spirit and #23 Elegant in Brown ($13 USD/1.7g). The 10-hour wear claim immediately captured my attention. Could these delightful slim lipsticks prove, one does not need to spend an arm and a leg to get fabulous results? You’ll see. Sephora Collection Color Lip Last #22 Burgundy Spirit. Sephora Collection Color Lip Last #23 Elegant in Brown. 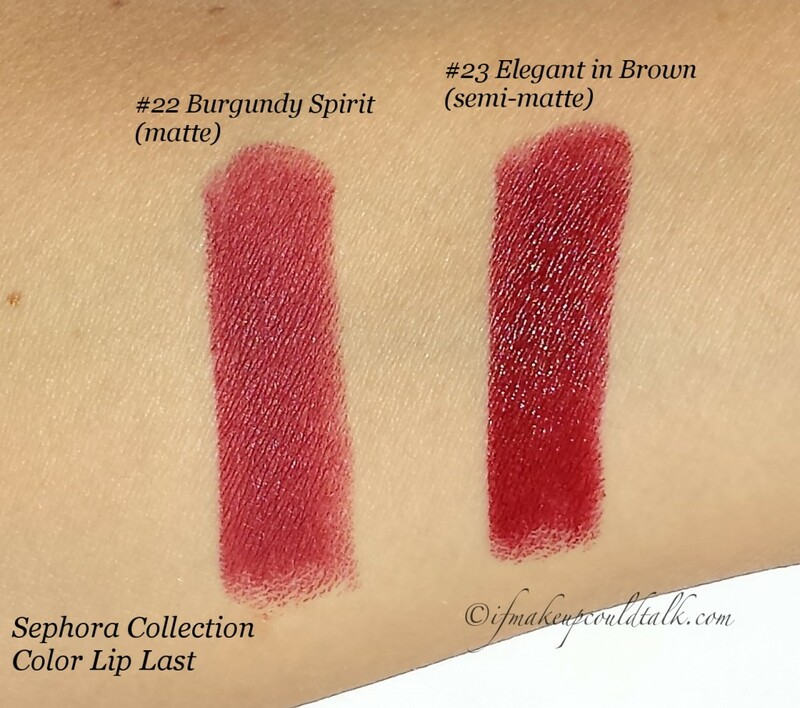  Sephora Collection Color Lip Last #22 Burgundy Spirit and #23 Elegant in Brown swatches. #22 Burgundy Spirit is a matte formula that is described as a “matte mauve”, however on me the color deepens more into a pink based red. #23 Elegant in Brown is a semi-matte formula that is described as a “deep mauve”, however on me the color translates to more of a deep burgundy red…gorgeous! Thin stick design allows one to apply the lipstick with more precision than the standard lipstick style. Compact style fits nicely in the smallest of handbags. 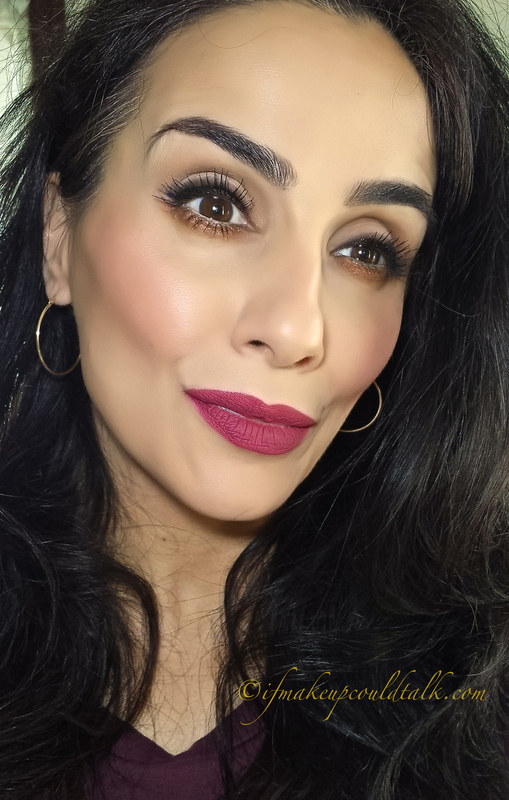 The matte formula settles on the lips within 30-45 seconds and behaves exactly like a matte liquid lipstick (similar to Dose of Colors reviewed [here]). The matte formula does not budge until it is removed with an oil based remover. Lasts 6-7 hours before there is a need for reapplication. #22 Burgundy Spirit can be worn without a lipliner–color does not bleed into fine lines. Quite comfortable for a long wearing matte formula. 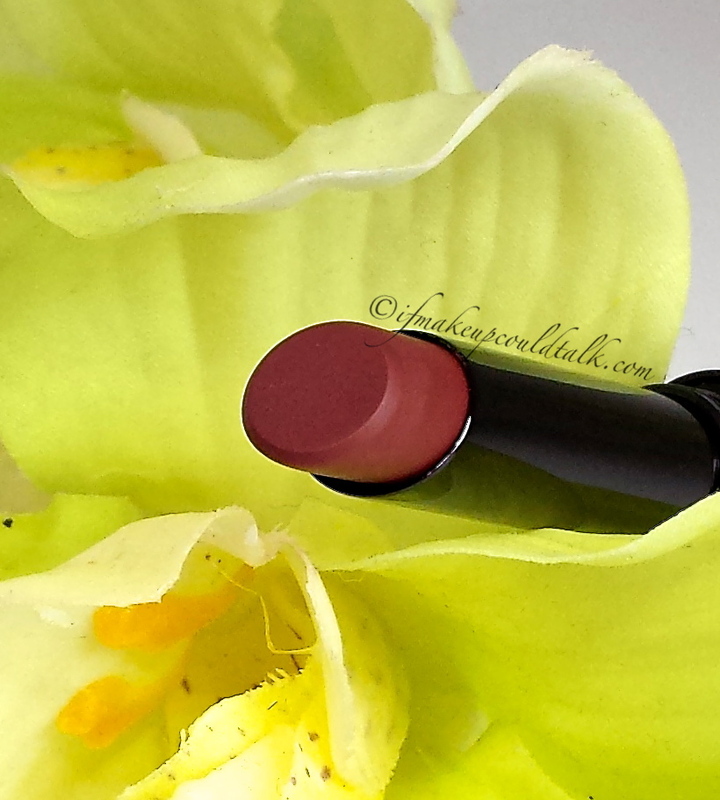 The semi-matte formula is rather saturated with a glossy texture that feels hydrating and makes lips look plump. #23 Elegant in Brown applies with the greatest of ease and lasts on its own for 4½ hours before there is a need for reapplication. When the semi-matte formula does wear-off, a potent stain is left. An additional layer of #23 Elegant in Brown can be applied over an existing layer without feeling heavy or looking caky. Slight grape fragrance is pleasant and imperceptible after a few seconds. Both formulas are made in Switzerland. #22 Burgundy Spirit wears off in the center of the lips–the spot that comes in contact the most with saliva, food, etc. The outer color can be difficult to remove without an oil based remover on hand. Due to the drier texture inherent in the matte formula, an additional layer over an existing layer can look drying, but definitely feels bearable. Due to the more emollient composition found in the semi-matte formula, feathering does occur by the fourth hour of wear if worn without a lip base/liner. It goes without saying, oil based foods/glosses will break down both formulas. Sephora Collection Color Lip Last #22 Burgundy Spirit lip swatch. 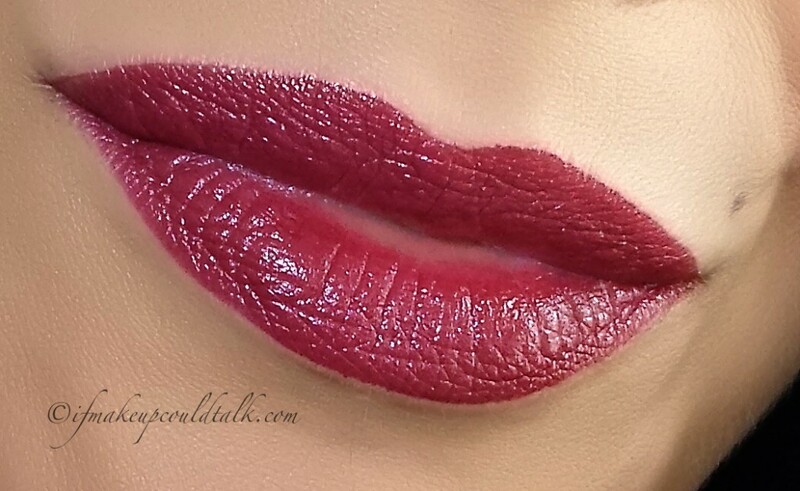 Wearing Sephora Collection Color Lip Last #22 Burgundy Spirit. As you can tell by the above photos, #22 Burgundy Spirit is quite an opaque color. Proper exfoliation of the lips is necessary before application. Personally, despite the dry matte texture, my lips did not feel dry or uncomfortable, but they were not hydrated either. After 6½ hours of wear and copious amounts of talking and some drinking, I was able to apply an additional coat to the center of the lips. The results were not as uncomfortable or unsightly as with one would expect from a long wearing formula. Should the matte look not suit your taste, I found the drier texture to pair well with my Dior Fluid Sticks and Shiseido Lacquer Rouge–the results were amazing! This formula is perfect for those who love the look and staying power of matte liquid lipsticks and for those who have feathering issues. I fall into both categories, so this was a total score of me. 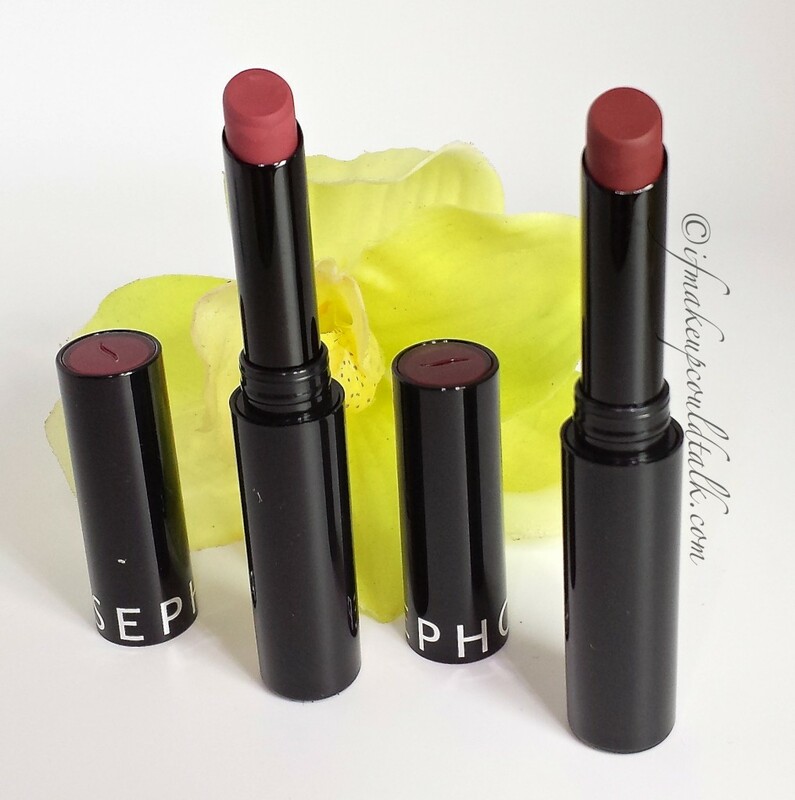 Sephora Collection Color Lip Last #23 Elegant in Brown lip swatch. 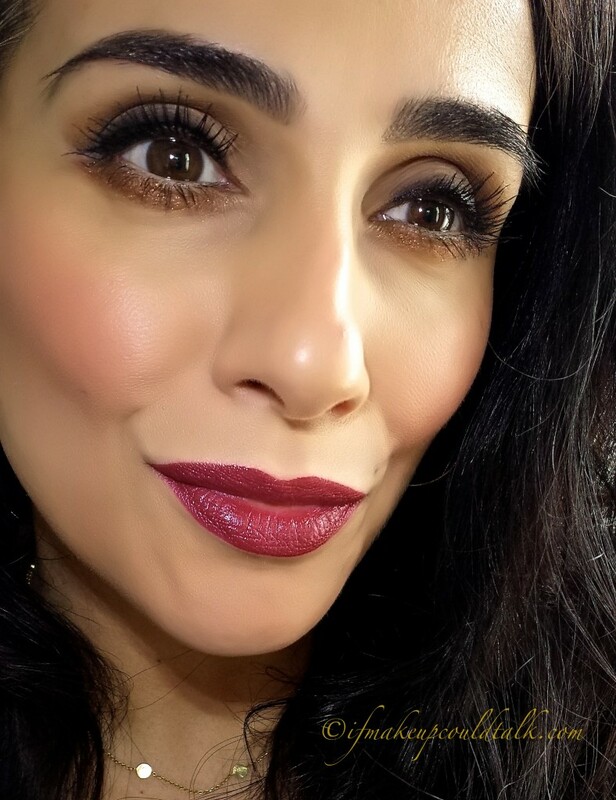 Wearing Sephora Collection Color Lip Last #23 Elegant in Brown. As you tell from the photos, #23 Elegant in Brown is not so brown, but a beautiful burgundy red color. Unlike the matte formula, the semi-matte formula would most likely appeal to a wider range of people. 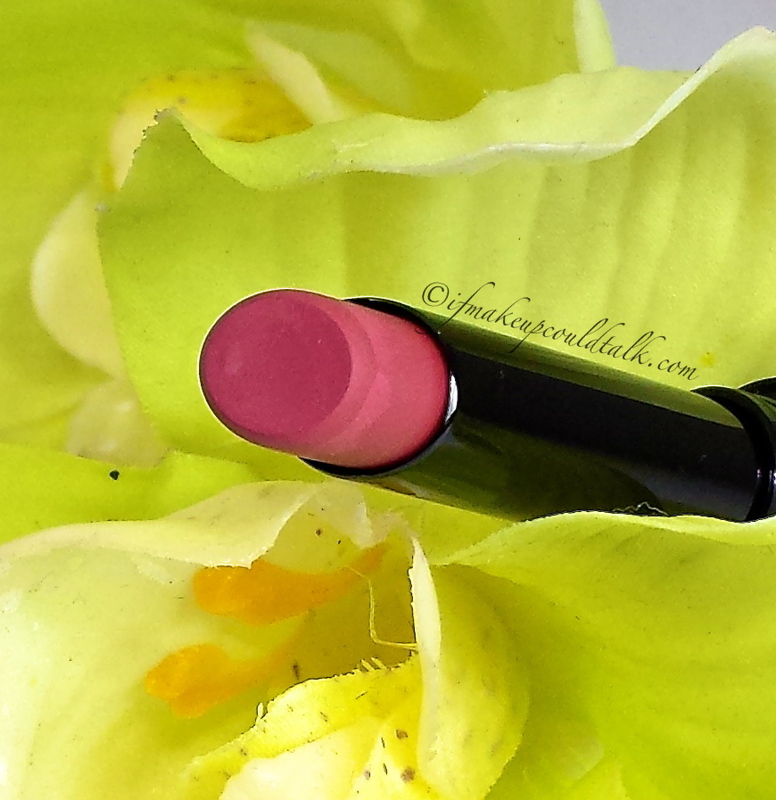 The smooth pigmented color wears well and reapplication is hassle free. Personally, I need to wear a lip base/liner in order to prevent feathering, but if this is not an issue for you, then this lipstick is just as impressive as some higher-end brands. Makeup would tell you Sephora Collection Color Lip Last #22 Burgundy Spirit and #23 Elegant in Brown have impressed me quite a bit. The 10 hour wear claim is a definite stretch, but there is no denying both colors performed just as well as some higher end brands. With 26 colors to choose from and three different finishes (matte, semi-matte and metallic) there is sure to be a slim stick to suit everyone’s taste and wallet. Until next time, be well, stay safe and be happy.